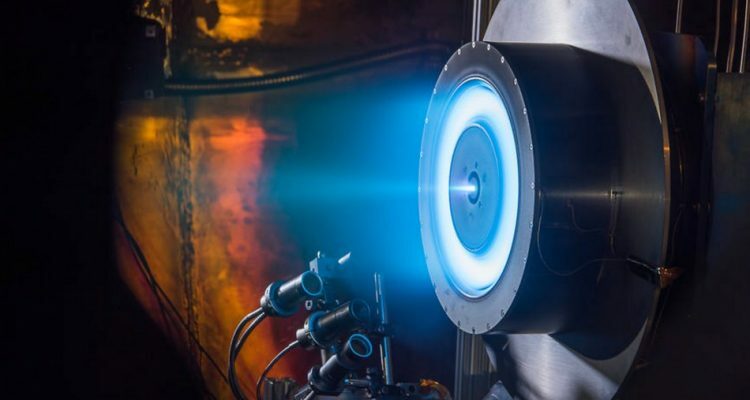 The X3 ion thruster is a very interesting project from NASA’s Next Leap program. The goal of this program is to develop some of the technologies that will further explore the solar system. X3 is a Hall-effect thruster. This means that it uses electric and magnetic fields to ionize and accelerate a neutral gas, xenon. Hall-effect thrusters have been used for space applications for decades. What distinguishes the X3 ion thruster is its high power and its great modularity. The engine developed by NASA and the US Air Force is composed of three concentric channels of acceleration. The X3 ion thruster can operate with an electric power of up to 200 kilowatts, which is enough energy to power a small village on Earth. This allowed it to set push records for a Hall-effect thruster : 5.4 Newton in a test run in 2018. That’s about the strength you feel when you hold a plate of butter in your hand , which is very little. But Hall-effect thrusters are designed to run continuously for weeks and even months, enough to provide real acceleration. This relatively high power makes it possible to imagine many applications to the X3 ion thruster. NASA wants to equip its lunar space station, the LOP-G, with an electric propulsion module. It will take a high power engine, perhaps even several, to effectively maintain the LOP-G in orbit. The contract for the construction of this first module of the LOP-G should be awarded in spring 2019. Perhaps we will hear about the X3 ion thruster at that time. An X3 cluster running at 800 kilowatts should also be able to propel an inhabited mission to Mars. This is what the project development team thinks. But it is difficult to provide such power to a spacecraft. This requires either installing huge solar panels or using nuclear energy. In an ion engine, xenon is first bombarded by electrons to form an ionized plasma. It is then accelerated through grids that have a large difference in electrical potential. The result is impressive, the ionized beam forms a bluish halo reminiscent of sci-fi movies. The thrust produced is still tiny, about 90 millinewtons. That’s close to the thrust of a sheet of paper placed on the hand. In 1998, NASA launched the Deep Space 1 space probe, its first exploration spacecraft with an ion propulsion system. Deep Space 1 has proven that with solar panels and a few dozen kilograms of xenon, a space probe can perform a mission well beyond the Earth-Moon system. Ionic propulsion has demonstrated its full potential for low-cost space missions, which can only carry a limited amount of propellant. NASA decides quickly to bet on this first success. This innovative propulsion technology allows to consider new objectives. Ionic propulsion makes it possible to reach certain destinations by spending ten times less propellant than with a chemical engine, provided to be patient. The accelerations provided are indeed tiny, so you have to run an ion engine for months or years to produce a significant acceleration. An ion engine also needs a power supply, and only solar panels can provide the power to make them work, which limits the possibilities a little, because beyond the orbit of the planet Mars the solar panels become almost useless. Ionic engines promise a bright future for space exploration. Their biggest strength is their low propellant consumption, and their biggest weakness is their lack of power. Developing a high power electric motor would therefore be a technological breakthrough that would give a big advantage to explore the solar system, and perhaps even to colonize it. A team of the University of Michigan is working with NASA to develop and test a Hall effect thruster called X3. This thruster broke all records of power and thrust. It was able to operate at a power of 102 kilowatts for a thrust of 5.4 Newton. It beats the push record of a Hall effect thruster by more than 60%. 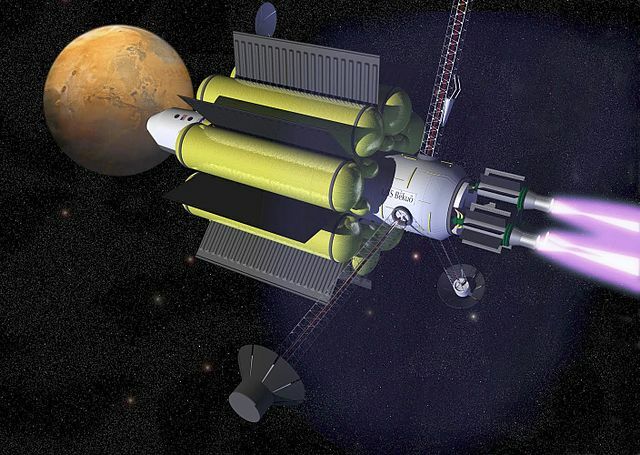 Ionic propulsion is one of the possibilities that NASA is exploring for a Martian journey. The X3 is currently capable of operating up to a hundred kilowatts. With a system running at 500 kilowatts or even 1 megawatt, this type of engine would become powerful enough to power inhabited missions beyond lunar orbit. To achieve more power compared to conventional Hall effect thrusters, the University of Michigan has designed a series of rings to channel the plasma. The thruster is quite imposing : almost a meter in diameter. We imagine that if we want to multiply the power by ten, the thruster will have to be huge. For the X3 to really prove itself, it has to perform a test of operation at full power for a long time. Ionic propulsion is indeed interesting only if low power is compensated by very long durations. The X3 will therefore undergo a test of 100 hours next year. The next step will be to integrate the X3 into a design created by the company Aerojet Rocketdyne. This company will be responsible for designing a power supply system and a xenon supply system for the engine. In its final design, the X3 should be able to run up to 200 kilowatts and be powered by solar panels. This is the main difficulty : the 2500 square meters of solar panels of the International Space Station (ISS) produce only 120 kilowatts of electric power, under the best conditions. The solar panel surface needed would be huge for a spacecraft whose propulsion system requires 200 kilowatts alone and to which should be added the electrical needs of the mission itself.